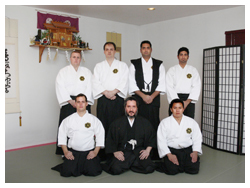 Fujiyama Dojo was founded in Canada in 1990 and operates under the direction of Y. Ichikawa, H. Hanmura, and G. M. Del Cueto and is the international representative for the Dai Nihon Daito Ryu Aiki Bujutsu Rengokai. 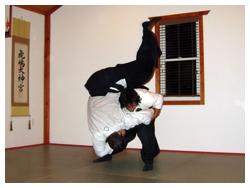 Fujiyama Dojo offers instruction in traditional Daito Ryu Aiki Bujutsu (oshikiuchi) and our curriculum also includes the study of Kashima Shinto Ryu and Onoha Itto Ryu Kenjutsu. 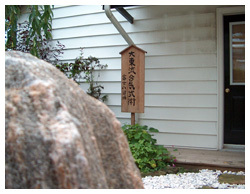 Fujiyama Dojo is a koryu (traditional school) with emphasis on character building, humility, respect and the preservation of a martial art as it has been passed down to us by the descendents of samurai from Aizu, Japan. The goal of our dojo is to preserve this ancient way of life through disciplined training and personal development symbolically known in Japanese martial arts as forging the spirit . As such, our dojo does not participate in competitions, nor do we award trophies, dan ranks, or multicoloured belts. Our dojo fees are $80 per month along with a one-time $30 material fee due upon joining our school and we do not require contracts or sign-up fees. Training at Fujiyama Dojo takes place in our newly renovated private dojo in Thorold, Ontario near the Pen Centre and all classes are small and personal. Women and children over 13 years of age are also welcome. All students are required to wear white keikogi, black hakama and black tabi (socks are an acceptable substitute for tabi) during class. Fujiyama Dojo is currently accepting new students. If you are interested in Daito ryu, we invite you to book an appointment to observe a class as this will give you the opportunity to see what we do and ask any questions you may have. For membership inquiries or to book a visit, please e-mail or leave a voicemail at (905) 680-6389. You may also write us at our mailing address above. Fujiyama Dojo also provides martial arts equipment from various suppliers located in Japan and Canada. We offer martial arts uniforms, weapons and protective equipment at competitive prices.